Neural tube defect (NTDs) are the birth defects that occur due to faulty development of brain and spinal cord. These defects occur when the brain and spinal cord are not completely covered with membranes and bones, leaving the brain and spinal cord open . NTDs occur in the 3rd week of pregnancy when some special type of cells on the dorsal aspect of the fetus begin to form the neural tube. The NTDs can be classified into two types, namely open NTDs and closed NTDs. Open NTDs are the most common type of these defects. NTDs are one of the most common congenital birth abnormalities, occurring in almost one in 1,000 live births in the United States. An NTD occurs very early in the developmental period since the neural tube is formed 28 days after conception. When the neural tube does not close adequately, a NTD develops. NTDs develop in the fetus before most women know they are even pregnant . The term anencephaly means “without head”. It is a type of open NTD’s that develop when the cranial end of the neural tube fails to close completely, usually during the 23rd and 26th days of pregnancy resulting in the lack of a major part of the brain and cranium. Infants born with this defect do not have the main parts of the forebrain and are usually blind, deaf and unconscious. Absence of forebrain part ensures that the baby will never gain consciousness [3,4]. Infants having this defect are either stillborn or usually die within a few hours or days after birth. Encephalocele is another open neural type of defect which is characterized by herniation of a part of brain through the skull that is sac-like and covered with meninges. Encephaloceles can be classified into various types depending upon their location. Encephaloceles are often evident and diagnosed immediately. In some cases small encephaloceles remain undiagnosed [3,4]. Hydranecephaly is an open type of NTD characterized by the absence of cerebral hemispheres; instead the skull is filled with sacs of cerebrospinal fluid . Iniencephaly is a rare type of open NTD that causes an extreme bending of the head to the spine. Diagnosis of this abnormality can usually be made on antenatal ultrasonography; however, immediately after birth “the bent head with face looking superior” will indicate the diagnosis. Usually the neck is absent. The skin of the face connects directly to the chest and the scalp connects to the upper back. The infant will usually not survive more than a few hours [3,4]. Spina bifida is an NTD characterized by the incomplete closure of bone around the spinal cord resulting in a defect in the spinal cord. It can be further divided into two classes; spina bifida cystica and spina bifida occulta . 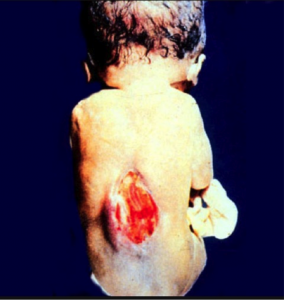 Spina bifida cystica can be further divided into two types, namely meningocele and myelomeningocele. Meningocele means herniation of the meninges (but not the spinal cord) through the defect in the spinal canal. Myelomeningocele means the protrusion of the meninges as well as the spinal cord through the opening [3,4]. By definition, spina bifida occulta refers to hidden split spine. In this NTD the spinous process and the neural arch appear abnormal on an X-rays, and are generally harmless. In most of the cases the spinal cord and spinal nerves are not involved [3,4]. There is no treatment available for anencephaly as the babies usually do not survive more than a few hours. There is certain role for aggressive surgical management in cases of spina bifida, meningoceles and mild myelomeningoceles. The outcome of surgical repair often depends on the amount of brain tissue involved in the encephalocele. The aim of treatment for NTDs is to allow the patient to achieve the maximum level of function [5,7]. Copp AJ, Stanier P, Greene ND. Neural tube defects: recent advances, unsolved questions, and controversies. Lancet Neurol 2013;12(8):799-810. Persad VL, Hof M, Dube JM, Zimmer P. Incidence of open neural tube defects in Nova Scotia after folic acid fortification. CMAJ 2002; 167(3): 241–5. Imbruglia L, Cacciatore A, Carrara S. Abnormal skull findings in neural tube defects. J Prenat Med 2009 Jul-Sep; 3(3): 44–7. Saboval L, Horn F, Drdulova T, et al. [Clinical condition of patients with neural tube defects]. Rozhl Chir 2010;89(8):471-7. Manning SM, Jennings R, Madsen JR.Pathophysiology, prevention, and potential treatment of neural tube defects. Ment Retard Dev Disabil Res Rev 2000;6(1):6-14. Main MD, Mennuti MT. Neural tube defects: issues in prenatal diagnosis and counselling.Obstet Gynecol 1986;67(1):1-16. Phadke S, Agarwal M. Neural tube defects: A need for population-based prevention program. Indian J Hum Genet 2012; 18(2): 145-7. The Spina Bifida statistics for West Virginia are as follows: About 2.91 babies out of 10,000 births are affected with this disease. The data was collected during the period of 2000-2004. The number of women who are due to give birth has not been tracked. Our research has shown that the number of people with this medical problem residing in the state of West Virginia is approximately 2,200. There are two SB clinics present in West Virginia, the Children with Special Health Care Needs and West Virginia University Medical Center. Both the SB clinics are located at Morgantown and provide assistance to patients affected with this health issue. The SB Association of the Mid-Atlantic Region (SBAMAR) is responsible for providing resources for people affected with SB. The Spina Bifida statistics for Mississippi are as follows: In this state the number of babies affected with this medical condition is unknown. Our research has not yielded the numbers of women here who are due to give birth with babies that may or may not be likely be at with this disability. The Mississippi State Department of Health which is located at Jackson provides help and services to patients who are affected with this medical problem. The SB Association of Mississippi that is also situated in Jackson is responsible for providing assistance to people affected with SB. The Camp Dream Street provides extra-curricular activities for children in the state of Mississippi. The Spina Bifida statistics for Delaware are as follows: According to the Delaware Health Statistics Center, one baby out of fifty-six babies who are born here that have a birth direct suffers from SB. However in this state, the numbers of women who are due to give birth to babies who are most likely going to be affected with this medical condition have not been tracked. The state of Delaware has a SB clinic which is located in Wilmington that provides help and assistance to patients who are affected with this health issue. The SB Association of Delaware Valley is responsible for providing medical assistance to people affected with SB. The Easter Seals Delaware and Maryland’s Eastern Shore, Camp Fairlee Manor provides extra-curricular activities for children. The Spina Bifida statistics for Wyoming are as follows: In this state the number of babies affected with this disease is not known. The state has around 167,000 women who are due to give birth to babies and some are likely going to be affected with this medical condition. People of Hispanic origin make up 7.7 percent of the population which comes to 41,000 (Hispanic women are at higher risk of SB than non-Hispanic races). The state of Wyoming does not have a SB clinic to treat patients affected with this medical problem. Since Wyoming does not have a SB association chapter, unlike other states, patients affected with SB can receive treatment from the SBA of Colorado (SBACO). Unfortunately there are currently no support groups, clinics or camps in this state. The Spina Bifida statistics for Wisconsin are as follows: About 2.60 babies out of 10,000 births are born with this medical problem. The data was collected during the years 2001-2005. The data shows an increase in the number of babies born with this disability when compared to previous data. Around 1,463 people who have SB are residing in the state. Our research has shown that 1.7 million women are due to give birth and at some risk of delivering babies affected with this medical condition. The number of people of Hispanic origin in the state is 5 percent of the population which equals 281,000 (Hispanic women are at higher risk of SB than non-Hispanic races). There are three SB clinics in the state. They can be found at LaCrosse, Milwaukee, and Madison. The clinic at Children’s Hospital of Wisconsin is the registry point for patients affected with SB. The SB Association of Wisconsin is responsible for providing help and support services in the state. The Spina Bifida statistics for Virginia are as follows: In this state 3.95 babies are born with this medical condition out of 10,000 births. The data was collected during the period of 2001-2005. That shows an increase in the number of babies who have been born with this health issue when compared to the previous data. Around 3,069 people are residing in Virginia with this medical problem. An estimated 1.7 million women are in the family way and are at some risk of delivering babies with SB. The number of people of Hispanic origin is 7 percent of the population or approximately 500,000 people (Hispanic women are more susceptible than other non-Hispanic races to SB). There are five SB clinics located in Virginia. They are located in New Kent, Richmond, Norfolk, Charlottesville, and Fairfax. Two SB Associations provide support services and resources in the state. They are the SB Association of the Mid-Atlantic Region and the SB Association of the Roanoke Valley. Easter Seals UCP North Carolina & Virginia Inc. 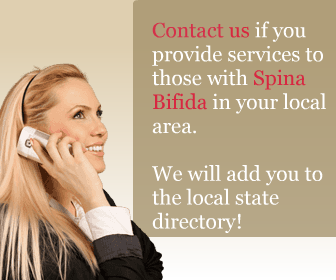 The Spina Bifida statistics for Vermont are as follows: In this state, the number of babies who are affected with this medical condition have not been tracked. Around 206,000 women are of child bearing age and some are at high risk of delivering babies who are affected with this disease. The number of people who are residing in the state of Vermont of Hispanic origin is one percent of the population (or 6000 people). As a note, women of Hispanic origin are at higher risk than non-Hispanic races of SB. There is one SB clinic in the state of Vermont located at Burlington which provides help and services to patients who are affected with SB. The SB Association of Greater New England is responsible for providing support services in the state. The Spina Bifida statistics for Utah are as follows: In this state 4.22 babies are born with this medical condition out of 10,000 births. The data was collected during the years 2001-2005. This shows a decrease in the number of cases when compared to the previous data collected. Around 1,155 people living in Utah are affected with this medical disability. An estimated 0.8 million women are due to give birth in Utah and some are at risk of delivering babies affected with this health issue. People of Hispanic origin make up 12 percent of the population which comes to 328,370 (Hispanic women are more susceptible than other non-Hispanic races to SB). There are two SB clinics in Utah and both are located at Salt Lake City. Fairfax Ave. at Virginia St. The Spina Bifida statistics for Texas are as follows: About 3.58 babies out of 10,000 babies are affected with this disease. The data was taken during the years of 2000-2004. The data shows a decrease in the number of SB cases when compared to the previous data collected. Around 8,709 people in the state have been diagnosed with this medical condition. An estimated 7.5 million women are of child bearing age and some will have babies affected with this health issue. Around 36 percent of the population which equals 8.7 million are of Hispanic origin (Hispanic women are more susceptible than other non-Hispanic races to SB). The state of Texas has twelve SB clinics. In Houston and San Antonio there are two SB clinics each. The remaining eight SB clinics can be found in Dallas, Brownville, Austin, El Paso, Lackland, Galveston, Lubbock, and Fort Worth. There are two SB Association that offer support services in the state. They are the SBA of North Texas, in Garland and the SB Association of the Houston Gulf Coast, in Houston.